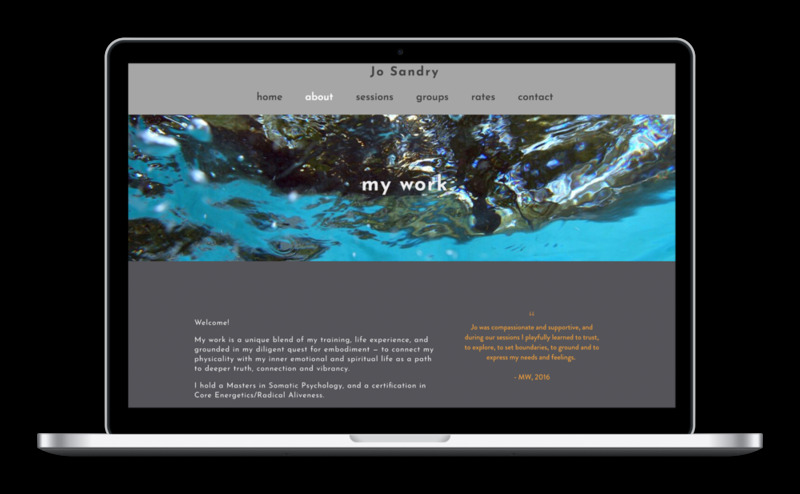 Designing the Squarespace site for Jo Sandry, a somatic therapist based in Marin County, was a great experience. She had previously been my high school English teacher, and in 2015 she hired me as a designer/ personal assistant for the short term transition into her new career as a therapist. Among other things required to set up her practice, she needed a website set up. We decided to use a Squarespace template so that she could go in and update everything herself as needed after I had stopped being her personal assistant. The challenge was that she wanted to create a website that didn’t look like “just another therapy website” (her words). She wanted something “cool”, “inviting”, “edgy”, and “clean,” all of which reflect her personality. We decided to go with high-resolution underwater photographs that her friend had taken as the common motif, and a color scheme of black, white and grays with a pop of marigold. Jo’s preference for typography is round, friendly sans-serifs, so for her headers and body text we chose Josefin Sans and Futura PT Medium. Unfortunately, Squarespace still doesn’t let you fiddle with your typesetting to fix any widows, orphans or rivers that might come up, but the client was happy with the overall effect.